You are here: Home / Selling / Petrochina (PTR) Climax Top? Are we watching a climax top in Petrochina (PTR)? If so, now is the time to dump shares and protect profits. So, you don’t want to dump them all; then sell half or at least a third of your position. 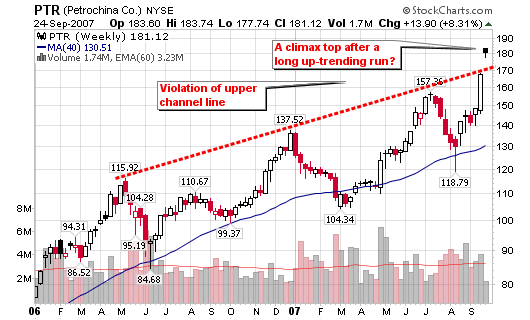 I have been taught to always sell all of a stock that has a climax top – this is where the stock has advanced for many months and suddenly races up for one or two weeks much faster than any prior one- or two-week period or since the beginning of the stock’s long move up). Petrochina is currently experiencing a dramatic push unlike any of the previous tops it has made over the past couple of years. Another rule I follow explains that you should sell when your stock exceeds an upper channel line drawn across three price peaks over a period of many months on a weekly chart. We can clearly see that PTR is now violating the upper trend channel after it touched three prior price peaks. 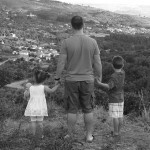 I can’t tell anyone what to do and I don’t want to either but I love presenting what I see based on technical analysis. PTR was a buy for me in February but I now see it as a sell. base on technicals you’re right I that 165 puts for Oct. is not a bad idea. What do you think? I was looking at puts myself but I like to go out two months. Time decay has killed me in the past. Better risk/reward for October puts. PTR has performed brilliantly in the past few months, outperforming its peers by a large amount. 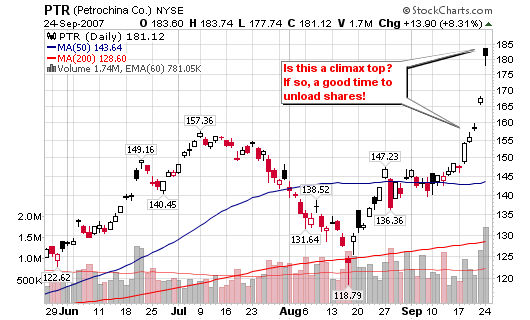 I think your hypothesis that this may be a climax top is very solid. If I owned the stock I’d probably sell 75% of my shares or so. You drive a good argument Chris, but with the market the way it has been the last couple days (riding the Fed’s rate cut)should we be picking tops? I’d wait for a confirmation that its a top before anything. Definitely looks like it’s gone parabolic. I’ll be looking for shorts after if it drops and consolidates. I just want to be clear: I never said to short the stock. I just said to take down a portion of your position (grab profits). I don’t pick tops (never have, never will). I pick profits! Looks like it’s forming a high tight flag. May go straight up from here.